I have a new project tutorial over on the Simon Says Stamp blog today! I hope you'll pop over to see how I created this Etcetera Tag with new Alcohol Lift-Ink. 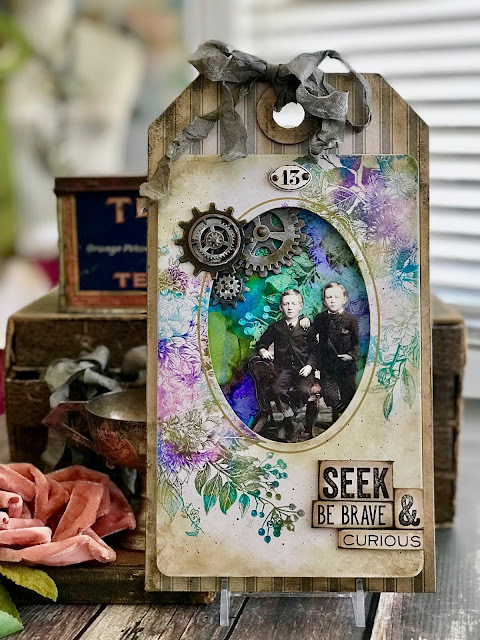 I love the way the tag turned out using such rich colors of Alcohol Ink and the Glorious Bouquet stamp from Stampers Anonymous. Don't you? To see the tutorial click HERE. Okay I said it over at Simon and I'll say it here too...pure perfection!!!! This is a stunning tag! I am off to see how you made it. Ms. PAULA!!! Your fabulous project/tutorial has absolutely captured EVERY bit of the appeal and curiosity I found for the alcohol ink color lifting/stamping technique!!!! Thank you for sharing your talents with us!!! Your work never ceases to amaze me. Love it! Totally amazing! I've saved the link so I can try it once I get the Ink Lift! The flower stamp seems so ideal for using with the lift technique. I admire the strong color contrasts and how nicely the collage frame fits on the large tag board. First time I've ever seen anyone describe how you can attach the gears together with brads. It is inspiration perfection! Paula, what an amazing tutorial, so many techniques and tips (love the Washi tape tip). The resulting tag is divine, I love the colours and the sentiment. Thank you for the inspiration. Ohmyword, this is absolutely stunning! !